Composite image of a suspect wanted in connection with a sexual battery that occurred on the Northwest Campus Jan. 13. 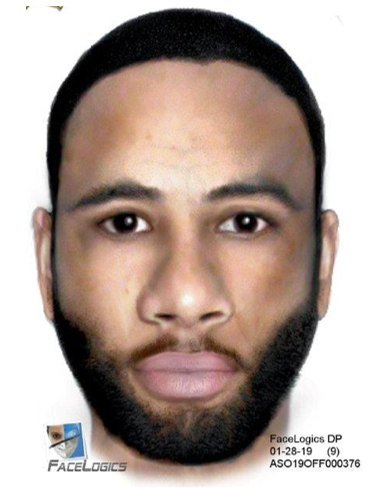 February 1, 2019 – The Alachua County Sheriff’s Office has released a composite sketch of the suspect wanted in connection with the sexual battery that took place on Santa Fe College’s Northwest Campus Jan. 13. Santa Fe College Police are working in conjunction with the Alachua County Sheriff’s Office. The 19-year-old victim was approached by a man with a knife and was forced into his vehicle where the battery occurred. Authorities at Santa Fe College have been focused on getting the victim the support services she needs. Detectives have continued to work with the victim since the incident occurred to get information out to the public in a timely manner. However, this is a trauma informed response and a victim-centered investigation. Authorities are continuing their investigation, and anyone with information about this case is asked to notify the SFPD immediately at 352-395-5519 or ACSO Detective J. Eady at jeady@alachuasheriff.org or 352-367-4177.